Read Robert’s blog post on Forbes. Many American taxpayers are tracking developments in tax reform plans, yet it’s uncertain if it will happen. Consider the adage: “Don’t let the tail wag the dog.” The tail is tax reform, and the dog is your investment strategy. Some invested in the “Trump trade” — a surge in market prices based on perceived corporate tax cuts and deregulation — and they are waiting to sell winning positions after they expect Congress to lower tax rates. Companies are deferring revenues and accelerating expenses to postpone income to 2018 when lower tax rates may apply. So, what’s an investor to do during this time of uncertainty? If you feel market conditions are right for selling individual securities or other financial instruments, then you should sell. Don’t wait for lower tax rates, which may not be as good as expected, or not come at all. The 2017 tax rates on long-term capital gains, held 12 months, are reasonable by historical standards. In the 10% and 15% ordinary tax brackets, long-term capital gains rates are 0%. In the 25% through 35% brackets, the long-term rate is 15%, and in the 39.6% bracket, it’s 20%. In Trump’s tax plan, the top long-term capital gains rate is 20%, and in the House plan, it’s 16.5%. If an investor holding a long-term capital gain believes the price may decline soon, they should consider selling that position in 2017 because a 2018 capital gains rate may not generate tax savings. It would create tax deferral for one year. 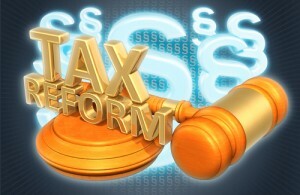 It’s uncertain if Congress will repeal the Obamacare 3.8% net investment tax (NIT) for funding Obamacare expenditures. The Obamacare repeal and replace bill included a repeal of NIT, but that bill failed in the Senate. Although tax reform plans include repeal of NIT, it might survive final negotiations in pursuit of making tax reform revenue neutral. Only the wealthy (the upper 2% of Americans) pay NIT. It’s not a business tax cut that Republicans can argue spurs job creation. President Trump doesn’t want Congress to give up on a new Obamacare repeal and replace bill. If you sell a security for a $100,000 capital gain in 2017 and owe the top long-term capital gains rate of 20% and the 3.8% NIT, your federal tax liability is $23,800. That leaves you with $76,200 (assuming there is no state tax). If tax reform fails entirely or comes up short of expectation, the Trump trade could reverse course. Investors might then sell positions at lower prices, yet similar tax rates may apply. Tax reform may be a massive tax cut on short-term capital gains, so investors may want to wait for details including legislative language to clarify this question. Traders in securities include day traders and swing traders, and they are not going to modify their holding periods for tax reasons. It’s going to be a challenge for the White House and Congress to sell the American public on the need for tax reform including massive tax cuts at a time when many U.S. public companies have high net profits after tax and record-high stock prices. The proposals provide similar tax cuts to wealthy business owners operating through pass-through entities including LLCs, partnerships, and S-Corps. Supporters say the tax cuts will bring economic growth because companies will invest their tax savings in U.S. job creation and wage hikes. But, opponents say this is wishful thinking: The current productivity trend is for U.S. companies to invest in robots and other automation, replacing human workers. Plus, the offshoring trend continues to make sense, given record low U.S. unemployment rates and considering that the House dropped its controversial border adjustment tax. Both sides will present studies buttressing their position. President Trump held a pep rally for tax reform in Missouri on Aug. 30. The president argued that tax reform helps businesses, which will surely use the savings to hire workers, raise wages, and increase paychecks. The White House said it wants employees to see bigger paychecks starting in January 2018, which will help when they turn out for the mid-term elections in November 2018. But, the most significant tax most middle-income employees have on paychecks is payroll taxes, not income taxes. The payroll tax has two components: 12.4% social security up to the SSA base amount, and 2.9% Medicare without any limit. Congress raises the SSA base most years: For 2017, the SSA base is $127,200, up 7% from $118,500 in 2016. That translates to a tax hike of $1,079 for 2017. In 2007, the SSA base was $97,500. If Republicans want to help workers as they say, why don’t they reduce payroll taxes? President Trump and Treasury Secretary Steven Mnuchin say tax reform with tax cuts will spur growth rates to more than 3% for many years. Many economists disagree, although the government just revised up the Q2 2017 growth rate to 3%, and that’s an outlier over the past decade. When Congress’s independent body, the CBO, scores the tax cut bill, it probably won’t use dynamic scoring with 3% growth rates over a prolonged period. Tax cuts are likely to be scored as revenue negative, which means they incur deficit spending. If you take away the tax cuts for business and just simplify the tax code by closing many loopholes and deductions, there may not be as much support for the bill. There are lots of winners and losers in tax reform, including voters in high-tax states losing state and local tax deductions. Democrats claim Republican tax reform proposals focus on tax cuts for the wealthy. Senate Minority Leader Chuck Schumer (D-NY) indicated Congressional Democrats and Independents might oppose an increase in the debt ceiling if it’s used to finance tax cuts for the wealthy. Treasury Secretary Mnuchin and National Economic Council Director Gary Cohn promised more information on tax reform in September with passage promised before the end of 2017. Let’s see what legislative language they and the other Big Six tax writers offer in September and October with a crowded legislative calendar including the 2018 budget, increase in the debt ceiling, and several emergency measures including Hurricane Harvey and North Korea. The expected pathway for tax cuts is Senate budget reconciliation, where Senate rules allow a 51-majority vote, rather than 60 votes needed for cloture (moving forward). Without any Democrats expected to support the Republican bill, the Senate can’t get to 60 votes required for the regular procedure. Using budget reconciliation requires the provision to balance. Otherwise, it’s temporary (sunsets) in 10 years. President Trump has berated Senate Majority Leader Mitch McConnell to change Senate rules, but McConnell won’t budge, so far. Ten-year tax cuts are good for some, but some corporations may not want to build new factories considering that a new Congress and President could repeal and replace these tax cuts. As we learned with the failure of the majority vote for the Obamacare repeal and replace bill, it only takes three of the 52 Republican senators to vote a bill down if there is no support from Democrats or Independents. Uncertainties and speculation surround the upcoming vote on tax reform, but one thing is sure: We all must be ready for a September and October showdown. Don’t count your tax cut chickens until they hatch and keep an eye out for the Trump trade. This entry was posted in 2017 Tax Cuts and Jobs Act (TCJA), Politics and Taxes, Tax Changes & Planning on August 31, 2017 by Robert Green.